The author has had a burning passion for his whole career to present Austrian business cycle theory in terms that mainstream economists can understand. Professor Roger Garrison is a leader in the field of Austrian macroeconomics, and has had a burning passion for his whole career to present Austrian business cycle theory in terms that mainstream economists can understand and identify. This book represents the culmination of his efforts in that regard. He sets the Austrian theory against the Keynesian and mainstream theory, and shows how they are different in terms of the relationship between money, interest, capital, and investment. By doing this, he not only shows the precise way in which Keynesian theory makes unrealistic assumptions about the way the world works; he also shows how the Austrian theory more fully captures the actual workings of the market in real-world settings. He thereby goes a long way toward refining the positive theory. In particular, this volume is useful (and famed) for its clear graphical exposition of the trade cycle theory. He shows the interrelationship between all the factors that affect investment, without leaving out critical dynamic issues such as time and the heterogeneity of the capital stock. This book is useful for anyone who seeks to gain the clearest possible perspective on the mechanics of the business cycle. But it will be especially appreciated by those who are confronted with Keynesian-style modeling in school or professional life. The book was published in 2006, and is made available here at a price far lower than the original publisher put on the book. The hope is that it will lead to wide distribution of this important and modern contribution to Austrian macroeconomics. I think this is an excellent book from the point of view of a beginner like myself to understanding austrian economics. Austrian economists usually don't like to use graphs and charts, which can be confusing sometimes for visual learners. Dr. Garrison, by combining the production possibilities curve, loanable funds graph, and the hayekian triangles, makes the theory available for all to understand. In this regard, a great book. 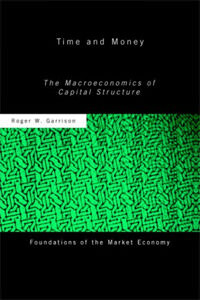 A meticulously thought out and clearly written exposition of Austrian macroeconomics. This book is what you should read if you are an economist working or teaching mainstream macro and want to know what all this Austrian fuss is about. Before long you´ll be knee-deep in Hayek and Mises. Mr. Garrison's(is it just me, or is it impossible to say this without chuckling at the thought of a certain animated namesake educator?) knowledge of Austrian economics is rivaled only by his in-depth knowledge of all the other schools of economics, and that makes all the difference. His approach is far less dismissive and antagonistic towards erroneous economic thought such as that of Keynes than say, Rothbard's, and the overall feel of this book is that it aims to educate - not lambast or pontificate. If you have a economics professor who can't understand your passion for Austrian economics and you want to enlighten him, this is THE book you should recommend. Mises wrote this book for the ages, and it remains the most spirited, thorough, and scientifically rigorous treatise on money to ever appear. Machlup investigates and explains the relationship between expanding credit, monetary policy, and rising stock prices.